Note: I originally wrote this post back in 2014 and then updated it in 2015 when I had more experience with the first product I bought. I’m updating it again now because I’ve found some more options that are working even better for me. For a long time, I just lived with it and did my work and web surfing from inside the main house, but the biggest problem was that I would be awake much earlier in the morning, so I would be cut off from the Internet for several hours. Not fun. During my visit in the summer of 2014, I finally did some research to try to find a solution to the problem and discovered the D-Link Wireless Range Extender (DAP-1320), which had good reviews online. Unfortunately, I only got it at the end of my visit and didn’t have time to test it out then. I took the unit back home where I set it up and used it to strengthen the Internet signal in my backyard, which worked really well. But I didn’t want to write a review of it then because I knew the real test would be back at my parents’ place. So I brought the device back to Ottawa during my holiday visit that year. And it worked… most of the time. When it worked, it worked great and I had no trouble connecting to the Internet and getting decent download speeds. But once in a while it just wouldn’t connect, even though it showed me plenty of bars. I don’t understand enough about how exactly wireless signals work, so it’s possible the problem was partially due to the Internet service provider’s equipment or signal strength, or a combination of problems between the ISP and the device itself. I probably would have just continued to live with the situation but in 2016 I had to come to Ottawa for an extended stay because of some family health issues. (All is well now!) And there was just no way I could handle being without a consistent Internet connection for two months. So it was time to figure out this thing. And once I did, it made a huge difference! 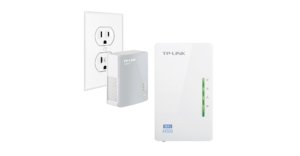 The way this system works is that you connect the smaller device to your router with an Ethernet connector and plug the larger device into an outlet closer to where you need to access the signal. The “Powerline” part of it uses your home electrical wiring to send the Internet signal from the first device to the second one, so it’s like the second one is connected by wire to your router. And a wired connection is stronger than a wireless one. Then the second device works like the first Wi-Fi repeater I had, but it’s sending the signal a much shorter distance through fewer obstacles. The second device also has ethernet ports so depending on where your computers or other Internet connected devices are, you can connect to it with a cable, thus making the entire connection wired. Note: There’s also a Powerline system where the second device doesn’t include the Wi-Fi extender function and you just use the ethernet ports for your connection. However, for this to work, the second device must be plugged into an outlet on the same electrical circuit as the first one. In my case, the apartment is on a separate meter so plugging the outlet in there wouldn’t work, which is why I need the system with the Wi-Fi capability. Well, THIS system was MUCH more stable than the extender by itself… most of the time. There were still times when the signal went weak, so I decided to try a couple more things. When I set it up, I plugged the second device into the wall outlet closest to the apartment, inside the house. So I tried moving it to an outlet in the hallway between the house and the apartment, which basically removed one wall from its path. The second thing I did was to plug a D-Link AC1200 Wireless Access Point into the extender’s ethernet port and use that to send the signal to the apartment. Again, I’m no expert on wireless technology, but from what I can tell, a Wi-Fi extender reduces the strength of the signal but the access point works more like the original router, sending the full-strength signal. Man, that’s a lot of info! But what does it mean for YOU? Everybody’s situation is going to be different so all I can say is if your problem is due strictly to having a big house or office, the wireless extender alone will probably help you. If the problem involves lots of obstructions between your router and where you’re trying to connect from, you’ll likely get better results from the Powerline system. And if that’s still not enough, you can try adding an access point to see if that gets the job done. I’m happy with my current setup. The big test is being able to watch HD videos through my streaming media devices, and I would say it works without problems about 80% of the time. 15% of the time there may be some level of buffering and 5% of the time I might have difficulty connecting to the Internet altogether. I can live with that. Note: I’ve seen recommendations that you give all the devices the same network ID as your router so that you only have to connect to one network and your computer, phone or other connected device will pick the strongest signal available. However, I like to name them all individually since most of my devices will automatically switch to another network if it’s stronger and it helps me see which one is having problems. I’ve written down the setup instructions below. There’s also an excellent video on Amazon that shows you the whole process. Because there are two pieces of hardware with this system, there are a few things you need to set up. Again, if possible, set them up near your wireless router and then you can move the extender afterwards. Note: They recommend that you don’t plug the devices into a power strip because that weakens the signal. I’ve got the first device in a power strip because there’s no free wall outlet where I need it. Maybe that’s why my system occasionally has issues. Connect the smaller Powerline unit to your wireless router using an ethernet cable and plug it in. Plug the larger Extender unit in. Press the Pair button on the Extender for 2 seconds. Press the Pair button the Powerline. The two units are now paired with each other. Press the Wi-Fi Clone button on the front of the Extender. Press the WPS button on your router for 2 seconds. Now you will be able to log into the extender using the same password as you use with your router. There are two different methods to set up this extender, depending on whether or not your router has a WPS button on it to sync it to the device. In both cases you should plug in the extender close to your router for the set-up process and then move it to the location where it will work best for you. Note: The most important consideration for making the extender work well is where you place it. You want it to be about halfway between your router and where you want the signal to go. If it’s too close to the router, it will pick up the signal well, but still may not get it to you. If it’s too close to you, it will look like you’ve got a strong signal because you’re close to the device, but it may have trouble picking up the source signal. In both locations I’ve used it, I moved it around a few times to find the best location. The extender comes with a card that has the initial network information you need to set it up. It also has stickers with the same info that you can place right on the device in case you ever lose the card. This is the method you will use if your router has a WPS (Wi-Fi Protected Setup) button on it. It may say WPS on it or it may have an icon of two arrows making a circle. Plug the extender into an electrical outlet. It will show a red light, then flash an amber light. When the amber light starts flashing, push the WPS button on your router. Press and hold the button on the extender until it starts blinking green, then release it and wait until the light turns solid green (this could take up to 2 minutes). At that point, the connection has been made. In the list of Wi-Fi networks on your computer or other device, you’ll see a new option that looks like dlink-####. Connect to that option using the password listed on the card that came with the extender. If you want to change the name of the network or the password, in a web browser go to http://dlinkap.local (username: admin, password: leave blank) and go to the Wi-Fi Extender tab. Change the network name and/or password to whatever you want. Look at the list of Wi-Fi networks for an option that looks like dlink-#### and connect to it with the password listed on the card that came with the extender. Note that you will NOT be connected to the Internet yet. Leave the password blank for the admin login screen and click Next. Select Manual as the setup method and click Next. The extender will scan for available Wi-Fi networks. Select the network you want to use the extender with and click Connect. Enter your Wi-Fi password and click Next. Change the network name and/or password to whatever you want and click Next. Click Save. You’ll be prompted to reboot now or later. When you reboot, a countdown screen will let you know how much longer it will take to finish the setup. Your extender is now set up and you will have Internet access when you’re connected to it. If you ever want to change what network the extender is connected to, you can go to the admin URL on your device and change the settings from there using the steps above. Again, if you’re having any trouble with the signal, try moving the device to other outlets between you and the router to see if that helps. You don’t need to set it up again just by moving it; you’ll just have to wait for the light to turn from red to green before connecting. Sometimes the extender seems to stop working, or at least it seems like it’s not making a difference anymore. I’m not sure why this is but I suspect it’s similar to when your router stops working: glitches happen. If you have this problem, I suggest you reset the extender to factory settings and set it up again. You can see where the reset button is on page 9 of the user guide. And if you happen to have another solution to this problem, I’d love to hear about it! Setting this up is basically the same as setting up the extender except you Connect the Access Point to the ethernet port on the Powerline Extender. To change the settings, go to http://dlinkap.local (username: admin, password: leave blank) and use either the wizard or the manual setup screens to configure the device. Do you have any additional tips on how to strengthen a weak Internet signal? Add them to the comments below!